Like most event management and concert production firms, July 4 is one of the busiest weekends of the year. We had several clients, but two of them really stand out for two very different reasons. Please enjoy our recap, and feel to ask questions in the comments! The City of Celina is one of the fastest growing municipalities in the State of Texas. The demographic mainly consists of upwardly-mobile young parents with small children. City government is growing as fast as the City itself is – which leaves very little time for planning events. However, city events generate a feeling of community and civic pride, and are a true necessity for growing areas. How does city staff balance their time in promoting events vs other municipal responsibilities? In Depth Events was able to provide an In Depth solution for the City of Celina’s Splash and Blast event. This patriotic event features live music, fireworks, waterslides, and plenty of food and crafts vendors. We were able to help city staff by handling all social media promotion (including video promotions), sponsorship procurement, and other event management services, such as banner creation, poster creation and placement, and day-of-show sponsor and volunteer support. Our efforts helped to increase event sponsorship by over three times the amount they had in 2016. Furthermore, the event sponsors were pleasantly surprised with nearly five times the amount of attendees from previous years. Our pre-event social media promotion, combined with monitoring and responding to questions during the event on social media platforms, really paid off for the City of Celina. 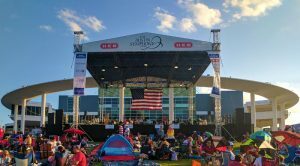 The co-founders of In Depth Events have been working with the Austin Symphony for years, providing the perfect stage and rooftop system for the official Fourth of July event for the City of Austin. Unlike most events in Austin, which are designed to bring tourists in – this event is specific to Austin citizens, and Austin people are serious about their music. So how does an event management company handle a concert event for one the most discerning audiences in the world? With integrity and professionalism. The lawn at the Long Center is one of the most challenging setups we do. 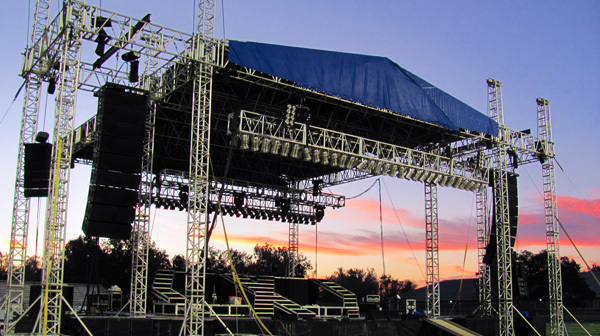 It starts with a 15-degree grade to setup our 40’x40’ load bearing stage and rooftop system. This makes usually mundane task like leveling a stage (or driving a forklift) much more difficult. Combined with 100-degree temperatures and an 80 pieces symphony orchestra on stage, this show is challenging to say the least. Once again, the staff of In Depth Events knocked it out of the park. 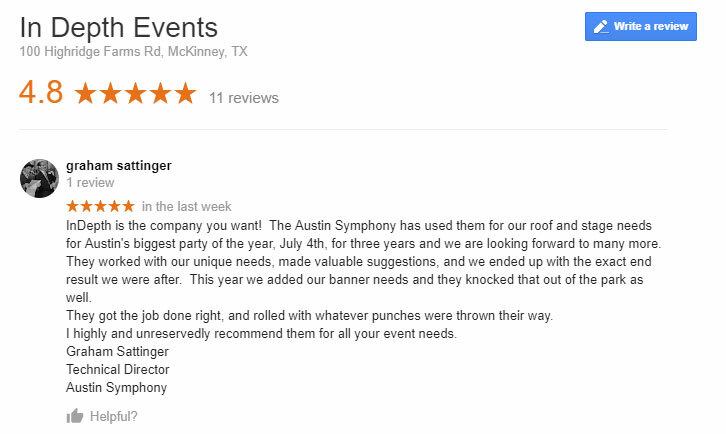 In addition to building the perfect stage and rooftop for the occasion, we were also able to add a touch of our event management services by designing a custom banner for the rooftop structure. This small addition made a huge difference in the look and feel of the stage, and promoted HEB (the title sponsor) in a far more attractive and visible way than before. We hope you’ve enjoyed this recap. Please feel free to ask us any questions about these events in the comments – and please contact us for your future event needs. We look forward to hearing from you, and working with you! 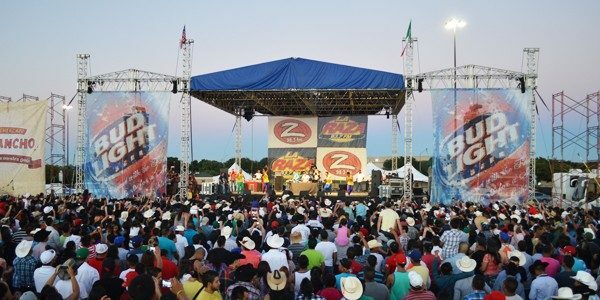 Univision Radio is one of the major players in the Dallas Fort Worth hispanic market. Their radio promotions department do a large concert event every May that pulls in a very targeted demographic of people and a large chunk of sponsorship dollars. With an estimated 20,000 people in attendance, sponsors get impressions to their potential customers via banners, logo rotation on jumbotrons and a VIP riser directly to the right of the stage. The attendees get a day long, non-ticketed event with multiple national acts, food vendors and on stage giveaways. Without even contacting us, Univision Radio began checking our references. As a certified building contractor in Dallas, a preferred vendor at Fair Park, Univision checked with some of our satisfied clients and on our solid reputation within the City of Dallas. Univision finally contacted us to request a bid. When our bid was accepted, Univision let us know that we were the only bidder – after checking our references, they knew that we were the vendor for their show. It’s always a pleasure to know that your work is recognized by your peers. When your reputation speaks for itself, then clients like Univision Radio (and our other clients) stand up and take notice. We lived up to their name and reputation by handling full production for this event. 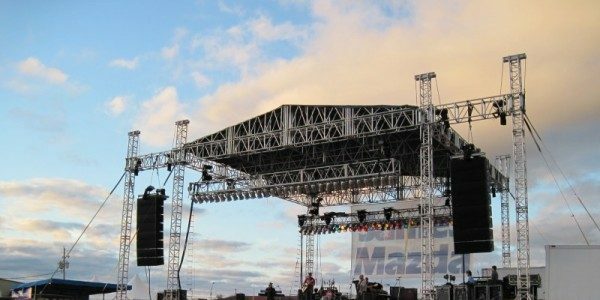 We provided a 40 foot x 40 foot load bearing rooftop structure, lighting, audio system, power distribution, scaffolding and barricade for this concert. 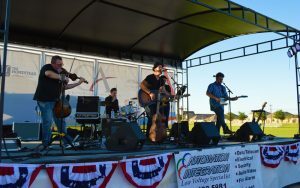 Our stage ran on time all day and set changes between the acts were smooth and trouble free. At the end of the show, the Univision Radio contact told our owner that it was the best, smoothest show that he had ever been involved with. Now, that’s what we like to hear! If you are ready to show your clients and sponsors how a festival stage should look and sound, then Ask Us a Question about your upcoming event. We are ready to promote your brands anywhere in the nation. We look forward to hearing from you and working with you! At In Depth Events, we love doing outdoor festivals – and we’ve done hundreds of them, all over the country. However, some of our favorite types of events are patriotic events and festivals. As I am writing this, I am sitting side of stage at an airshow in McKinney, TX. The local police, firemen and EMS personnel are here, as well as several vintage planes from WWII and other armed conflicts and a Vietnam-era tank. 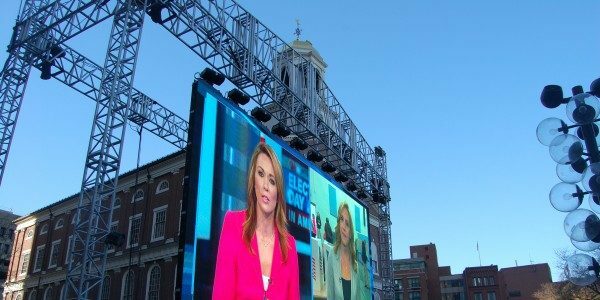 In Depth Events has provided a 32 foot x 24 foot load bearing rooftop with flybays, and a 32 foot x 24 foot’ stage with a monitor wing. It’s a beautiful November day in Texas and the last skydive team included a WWII veteran, a Korean War veteran and a Vietnam War veteran. Although I’ve never served in the military, I’m proud to be an American. 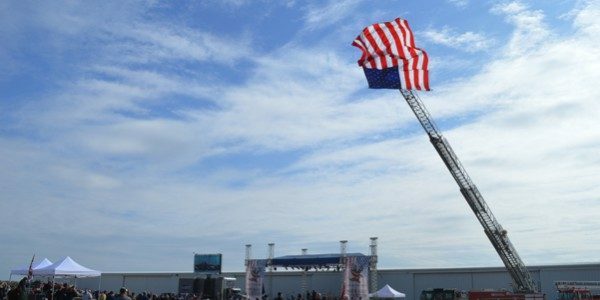 Our production rental team, event professionals and technicians all come from different backgrounds, but we’re all proud to be a part of patriotic events – whether the event is a huge Fourth of July extravaganza for a City or for a smaller regional show benefiting wounded veterans. For any event, you can trust that our event staff will provide exactly what you need. The stage and rooftop we’ve provided today is the perfect structure for this event. We’ll normally discount our production rental services for non-profits and today’s event is no exception. At In Depth Events, we’re honored to be a position to give back our services to people that have provided the very means for us to be in business. In Depth Events is a full service production company, providing audio rentals, lighting rentals and generator rentals in addition to our stage and roof systems. However, production rentals is a very small industry and many times, we’re referred a show by a production company that may not offer some of the services we do. Today, Alford Media is handling audio and lighting and provided the referral to the end client for our stage and rooftop. As you are reading this, you may be an event planner or another production company needing our services. Our audio rental inventory is available with our stages and rooftops or as a standalone production rental. Our lighting inventory is extremely diverse, and our special effects department can provide amazing, dynamic effects for your next event. Our production rentals services can be turnkey, but for some clients, they’ll only need a specific area of our expertise. In either case, we’re happy to work with you! On site, I’ve got a great band on stage and I’m enjoying watching the children eating cotton candy and wondering over the vintage planes. The adults are enjoying themselves as well, but they seem a bit more pensive. A child doesn’t have the capability to understand the sacrifices that the people in these planes made. As an adult, and a parent myself, I can only hope to identify with the heroes represented here – and I’m honored to be a part of this event and all our patriotic events! If you’re throwing outdoor festivals, then choosing the right production vendor is the single biggest decision you’ll make towards the success of your event. Take a look below to see a few tips on finding the right production vendor for staging rental, audio rental, and lighting rental for your outdoor festival! 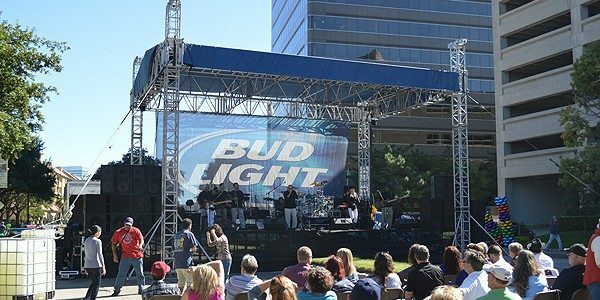 Whether it’s a college block party, a ‘City Of’, or a State Fair, having the right company for your stage and roof system, audio rental, lighting rental and generator rental can make or break outdoor festivals. Most importantly, you need someone that you can build a relationship with – someone that you trust will do what they say they are going to do. Building a relationship takes time. Begin looking for your vendors well in advance of your show. Have your details in place when you are interviewing vendors – overhead layouts of your venue, band riders and event dates and times are key to helping your production company provide an accurate quote for your event. In addition, most production companies like to see at least a three month advance contact before the date of your show and never less than one month. Frantically calling production vendors a week before the event date is not a way to build trust! Outdoor festivals are arguably the most difficult type of event there is for a production company. Tight set changes, multiple bands and crowd control issues are compounded by weather, temporary power and permitting requirements. 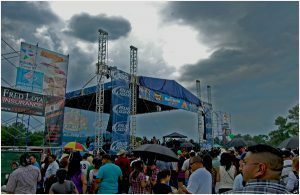 Your production company for your outdoor festival should be part of the solution, not an additional headache that you have to deal with. Therefore, you need to make sure they companies your are interviewing know what they are talking about! Conduct interviews with sales staff and project leads – a reputable company will be thrilled with the opportunity to meet with you and see the venue. Be prepared to get multiple bids and check them for the gear you need. Your production company should be open to discussion on the bid and the equipment listed in your quote. Finally, check references! The production company should own the majority of the equipment they are bringing to your show. Avoid ‘show brokers’ – they typically cause more trouble than they are worth and their references will reflect this. Ask about their safety records. Don’t hesitate to ask all companies bidding on your event about the reputations of their competitors. Production is a very small industry, and we’ve all worked together at one time or the other. A company that is reviled across the industry is bad news. Contrary to popular belief, not everyone is an audio engineer. However, you wouldn’t think so if you’ve ever attended a live event with bad audio. As the audience is leaving (usually before the event has ended) the common sentence heard from the audience is typically a version of “Wow, that sounded really bad!” Sometimes, the word used is a little more vulgar and rhymes with ‘fit’ – you know which one I mean! 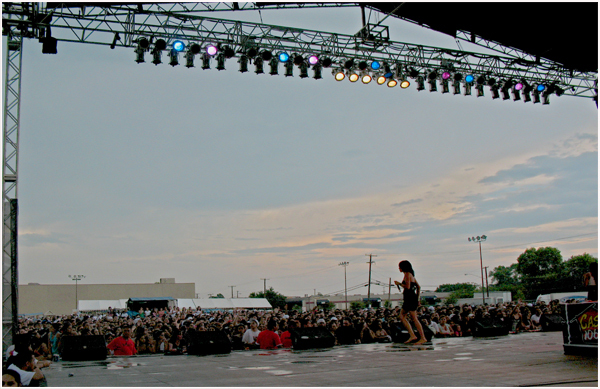 Choosing the right sound system rental is a vital part of the process of doing live events. The audio at your event needs to be clear with full range of lows to highs accurately broadcast. Notice that I didn’t say ‘loud’, because loud isn’t necessarily good sound! As a live event producer, marketing firm or even the ‘man on the street’ – live audio needs to sound good to get the message across. Hopefully, this article will allow you to walk away with a little more information on selecting the proper sound system rental for your specific type of event. In this article, we’ll begin with the basics and talk about loudspeakers. Loudspeakers can be grouped into two major categories for live events: Conventional Loudspeakers and Line Array. Conventional speakers (also known as point source boxes for the technically astute) are based on the same designs and components that became popular with the advent of the telephone and gramophone. You’ve seen these types of speakers ever since you were a kid and they are typically used for everything from high school choir performances to smaller concerts. Some people consider them a cheaper alternative to Line Array, but they are not the poor cousin. Conventional speakers have several advantages over Line Array, including the ability to cover a more diverse type of venue, better volume control in smaller areas and a much more natural sound at lower volume levels. 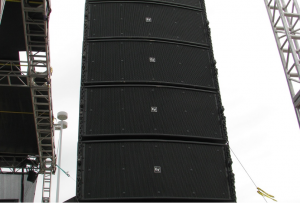 Line Array, while still using similar components as conventional speakers, are a different breed of loudspeakers. Introduced in the mid-90’s, Line Array uses constructive interference to throw sound farther than is possible with conventional loudspeakers. Typically, a Line Array is flown; hung from the ceiling of a venue or from a load bearing structure, as pictured. Line Array is also normally louder than conventional speakers. 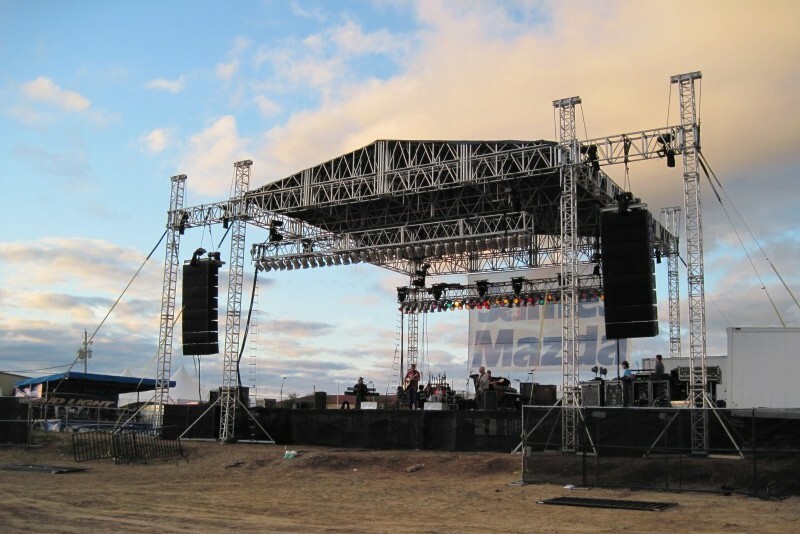 As a result, it’s used for large concerts in both indoor and outdoor venues. However, it’s not a solution for every show – it’s limitations in directivity and the very nature of its long throw characteristics make it a poor choice for intimate venues, certain types of outdoor events and events where flying PA is impractical. Technological advances in loudspeaker and amplification technology has made both types of loudspeakers viable options for your sound system rental depending on the type of venue and event you are planning.